Shanka has been learning to cook for a good deal of time, and has traveled far and wide to gain experience and add to his skill-set. 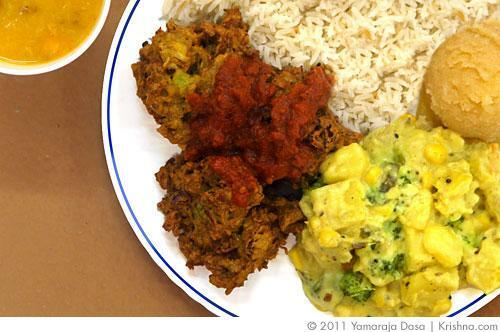 He brought his Indian recipes together in a self-published book, Simple Vegetarian Cooking, Indian Style. This particular kofta recipe calls for grated zucchini, which gives it a lovely, delicate texture and flavor. The tomato sauce brings a sweet acidity to the fried vegetable balls. Recipes vary wildly, calling for potatoes, cabbage, carrots, corn, peas, and even beets. Some of these, such as cabbage, is alternately served with a curry sauce rather than this thick tomato sauce. 1. Mix all kofta ingredients together until well distributed. Roll into 1 inch balls and deep fry in ghee until brown; drain. Set aside. 2. For sauce: Grind into paste the poppy seeds, ginger, chili, coconut and asafetida. In a saucepan, heat ghee. Add paste. Cook till brown. Add all other sauce ingredients and mix well. Cook till dry. Add kofta. Cover with 4 cups water and mix carefully. Cook on low flame for 5 minutes. Garnish with coriander leaves. Serves 6-7. Submitted by Anonymous on Sat, 06/30/2012 - 16:18. Submitted by radha on Thu, 07/26/2012 - 15:18. Submitted by Prathamesh M Kulkarni (not verified) on Mon, 02/07/2011 - 22:50. I'd love to make this dish. Could you please help me with selecting the Zucchini? We get green and yellow Zucchini here. We also get bottle guard here, should I use it instead? What is preferred? Submitted by Pishima on Thu, 02/10/2011 - 12:24. I suggest using either the green zucchini or the yellow squash for this recipe for best results. Submitted by yogita thakur (not verified) on Sun, 02/06/2011 - 05:51. Submitted by Pishima on Thu, 02/10/2011 - 12:25. Zucchini is a longish green squash. It is also called courgette in many countries. When cooked it becomes very soft.